Planning on seeing Marvel's The Avengers movie this weekend? 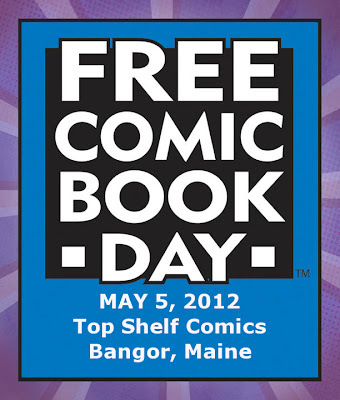 Make your weekend more MARVEL-ous by visiting Top Shelf Comics Saturday, May 5th for Free Comic Book Day. In celebration of independently-owned comic book specialty shops, Top Shelf Comics and other comic book stores around the world will be giving away Marvel comics (and other comics) for free! Top Shelf Comics in Downtown Bangor opens Saturday at 10am, so if you want to choose from the best selection of free comic books get there early. They will also be at the midnight debut of The Avengers movie tonight at Bangor Mall Cinemas 10 giving away coupons for Free Comic Book Day.